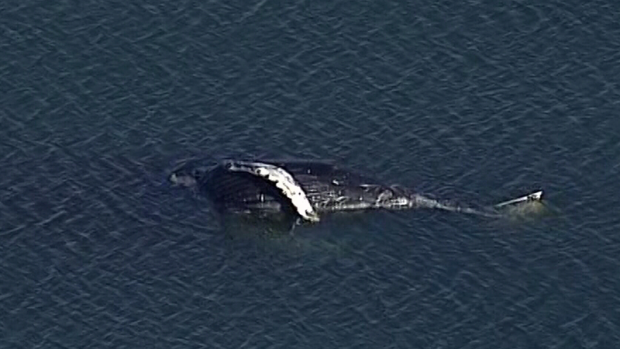 VANCOUVER - A ship strike has been blamed for the death of a female humpback whale that was found near Tsawwassen, B.C. The Department of Fisheries and Oceans says necropsy results on whale are consistent with catastrophic ship strike with propeller injuries. The whale was found near a BC Ferries terminal on Nov. 16. A new release from the department also says a transient killer whale calf, known as Biggs, that was found dead two days earlier died either because of neglect from his mother or it was separated from her because she had died. It says Biggs probably died three to five days after birth and further analysis is needed to determine a cause of death. Biggs's blood and tissue samples will be analyzed and the results will take about two to three weeks.